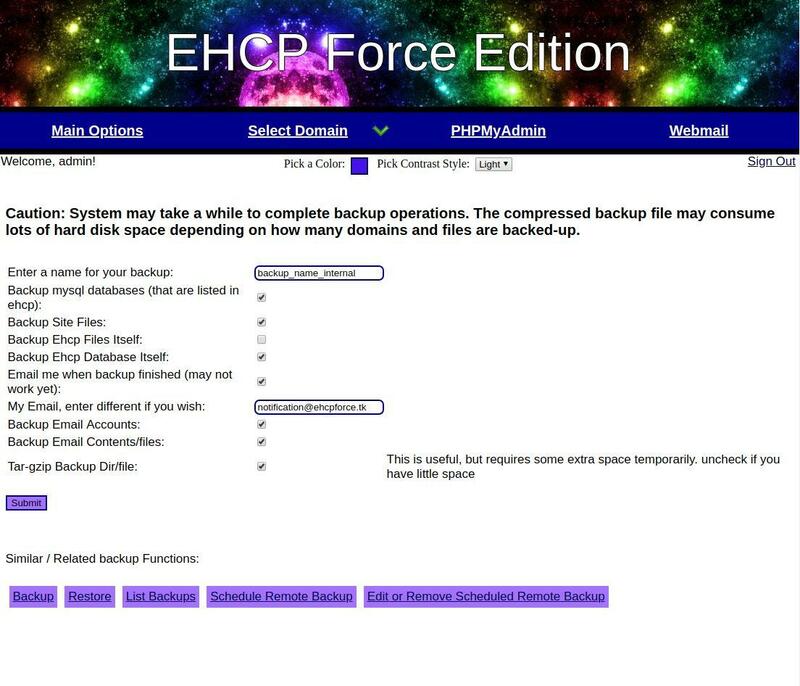 When you create a panel backup using EHCP Force Edition, a complete panel backup (containing all databases, web files, email accounts & received emails) is created and compressed into a .tgz archive file. All configured EHCP managed databases, web files, virtual email accounts (and message contents) are included in a full backup (as long as you use the default options when configuring the backup in the panel as shown in the picture below). Website files from /var/www/vhosts for all accounts are backed up, emails from the /home/vmail directory are backed up, and a complete database dump is created and stored in a sql file. If you've scheduled a remote backup, the backup archive .tgz file is then compressed and encrypted with OpenSSL before it is transferred over the internet to your configured destination. For more information about remote backups, please read information about OpenSSL encrypted remote backups. It is recommended that you do NOT backup the EHCP panel files themselves when configuring a backup, as when a restore is complete, the database credentials will no longer work since they were configured for the previous installation of EHCP Force Edition. If you plan on migrating everything over to a new server, the best way to do this is to install a fresh copy of EHCP Force Edition on the destination server. After this step has been completed, create a backup on the source EHCP Force Edition server. Copy the backup .tgz file (found in /var/backup on the source server) to the destination server and place it in the /var/backup directory on the destination server using SCP, FTP, SSH, or some other way of transferring the .tgz backup file. Once the file has been moved into the /var/backup directory on the destination server, login to EHCP Force on the destination server, and click on "Restore Backup". Enter the name of the archive including the .tgz extension and then click on "Submit". Your admin password on the destination server will now be set to the old password from the source server since the entire EHCP database was backed up and restored (so use the old password the next time you need to login - and change it later if you want). The EHCP daemon will restart itself, reload the configuration from the old server, and rebuild webserver templates as necessary. All databases from the previous server are imported including their MySQL users and privilege grants. The process has been simplified and several bug fixes went into the code in EHCP Force versions released later than July 15, 2018, so be sure to update your panel on the source and destination server to the latest version before attempting a backup, migration, and restore. If you run into any problems, be sure to report these bugs ASAP (in our forums preferably http://ehcpforce.tk/forums/) because this process is very important, and it can be nightmare if it fails!